GASPAR MARTINS ( Angola) said that the impact of war still had major consequences on the lives of Angola’s people, and gave his country first-hand knowledge of the importance of dialogue and negotiation for the peaceful resolution of conflicts. He pledged his Government’s continued efforts in that context at the regional and international levels, working with the regional groupings toward which it belonged. He said that the economic crisis demanded reform of the international regulatory system, greater fluidity and transparency in the allocation of capital to the least developed countries and greater support for sustainable development. The Rio+20 outcome offered a solid foundation in formulating national and international policies for the latter. However commitments needed to be translated into intense action on climate change, drought and desertification, natural disasters, urbanization and other areas. The session’s theme of peaceful settlement of disputes related to the need for reform of the Security Council, he said, calling for fair representation of all regions and the broadening of permanent membership in that body. Turning to local conflicts, he reaffirmed his support for the outcome of the Great Lakes summits on the Democratic Republic of the Congo, as well as the position of the African Union and the Southern African Development Community (SADC) on that situation. He urged continued international support for stabilization in Somalia and welcomed recent agreements between Sudan and South Sudan, urging the parties to continue their engagement with each other to resolve remaining differences. On other conflicts, he called for determination from the international community to preserve Mali’s unity, sovereignty and territorial integrity. On Guinea-Bissau, he advocated a comprehensive solution and lasting restoration of constitutional order according to international decisions. On Western Sahara, he called on the parties to continue negotiations under the auspices of the United Nations, so that the people could exercise their right to self-determination. He supported the two-state resolution of the Israeli/Palestinian situation, as well as a negotiated resolution of the crisis in Syria assisted by international mediation. On Cuba, he reiterated the need to end the embargo in accordance with United Nations resolutions. Mutual respect, regional cooperation and respect for international treaty obligations would continue to guide his country’s foreign policy, he said. 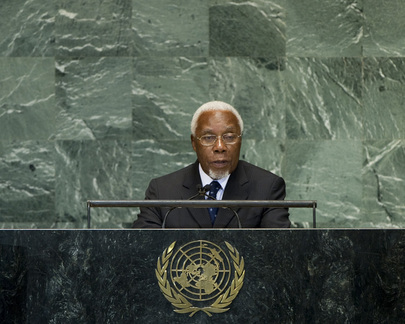 Turning to domestic issues, he said that ten years after attaining peace, Angola had made significant progress in consolidating democracy, leading up to successful elections on 31 August. Macroeconomic stability and the building of infrastructure had contributed to a progressive improvement of living conditions. It had not been possible to achieve the Millennium Development Goals, but the macroeconomic development rates had permitted consideration of the country’s graduation from the least-developed category in the near future. He expressed gratitude for the trust investors had placed in the country, as well as for assistance provided by international partners. He acknowledged that there was still much to do to ensure Angola’s economic growth was reflected in systematic improvement in the welfare of the people, through increased employment levels and enhanced investment in social welfare.